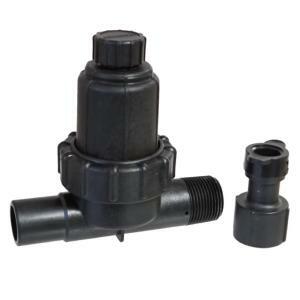 HydroRain's 2-in-1 Push-Fit drip filter and pressure regulator stands in the market, with no equal, as one of the industry’s best “one piece” low flow irrigation filter and regulator combinations. Outside, the 2-in-1 Push-Fit model is designed for strength and durability, featuring commercial grade glass-filled nylon body. Inside, the 2-in-1 Push-Fit model can handle water flow as low as 0.1 GPM and inlet pressure up to 80 PSI. The 2-in-1 Push-Fit model offers 30 PSI pressure regulation, a 200 mesh filter, and comes “drip-ready” with a .700" tubing adapter for a quick and easy, out of the box, connection to your drip tubing. Always install pressure regulator/filter downstream from all shut-off valves. Be sure to install pressure regulator/filter in the proper direction. The arrow on the housing shows the direction of the flow and should always point downstream toward emitters.